You will never take your air conditioner for granted during the hot summer months! Can you imagine a humid late-July without relief from the warm weather outside? This is why it is important to make sure that you always have a properly working air conditioner in your home. A working air conditioner is a necessity when coping with hot summer temperatures. Without it, enduring those summer months would be difficult, to say the least. Things happen. Sometimes, your trusty air conditioner breaks down and needs repairs in order to keep working properly. Unfortunately, your air conditioning system doesn’t care what time of year it is. It may need repairs right in the middle of those hot summer months. The last thing you want is to be stuck waiting on a repair during a heat wave! Proper air conditioning repairs will keep your Air Conditioner unit working well and make sure that your home stays at a comfortable temperature. Does it seem like your air conditioner always breaks down during the summer? When extreme hot temperatures hit, your air conditioner is running all day, every day. Which is exactly why air conditioners tend to break down during these times. Your air conditioning unit is put under a lot of stress and is constantly working hard to keep your home cool. It is also during these extreme temperatures that smaller problems are made more noticeable. Make sure that your air conditioner is well maintained. Proper assessment of your Air Conditioner unit can help to avoid these emergency repairs. Air conditioning repairs are a part of life. However, when you need them, you need them done properly and done quickly. At Heating Ontario, your comfort is our priority. We understand that you don’t want to wait around forever for your air conditioning repair. Our qualified staff is able to provide fast, quality air conditioning repair service. It doesn’t matter what type of air conditioner you have installed in your home. The air conditioner contractors at Heating Ontario will be able to repair your Air Conditioner unit effectively. Heating Ontario keeps you cool in the summer months with our professional air conditioning repairs. We are experts in both the heating and cooling industry. Whatever your air conditioning needs are, our team at Heating Ontario will find a way to repair your unit quickly, effectively, and at a reasonable price. If your Air Conditioner unit stops working or isn’t working the way that it should, then contact Heating Ontario. We don’t just handle your heating and furnace needs, but we also take care of your all of your air conditioning needs as well. Our experienced staff has experience dealing with air conditioning repairs all over Toronto and the GTA. Whether you need air conditioning maintenance or an emergency repair, Heating Ontario is there. You don’t need to stress out about rising temperatures. 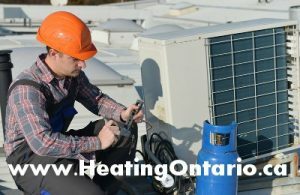 Heating Ontario is always there to provide air conditioning maintenance and air conditioning repairs, whenever you need it. Our knowledgeable staff will take care of air conditioning repairs in Toronto and the GTA – one repair at a time.